On this historic Election Day, I want to offer a tribute to one of the most inspiring women in our nation. She's a champion of freedom, unyielding in her position, and best of all, I think she's wearing a saree. Yes, I'm talking about the Statue of Liberty, and if you haven't bought your copy of her biography, what are you waiting for? Today's the perfect day to give or get this beautiful book published by Candlewick Press (and download the fabulous free teacher's guide, too). 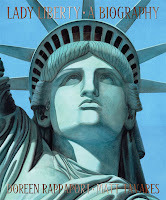 Written by Doreen Rappaport, the granddaughter of a Latvian immigrant, and magnificently illustrated by Matt Tavares, the grandson of a Portuguese immigrant, LADY LIBERTY describes how our country's symbol of hospitality was built against all odds. Thanks to a medley of first-person voices, including an engineer, a plasterer, a carpenter, a poet, a coppersmith, a journalist, and even a farmer's daughter, this story of the Statue reads like a song that makes you want to place your hand over your heart. Or use it to clasp a torch and lift it high.